A simple app that enables you to try different DSD playback modes such as DoP, DoPA and PCM. 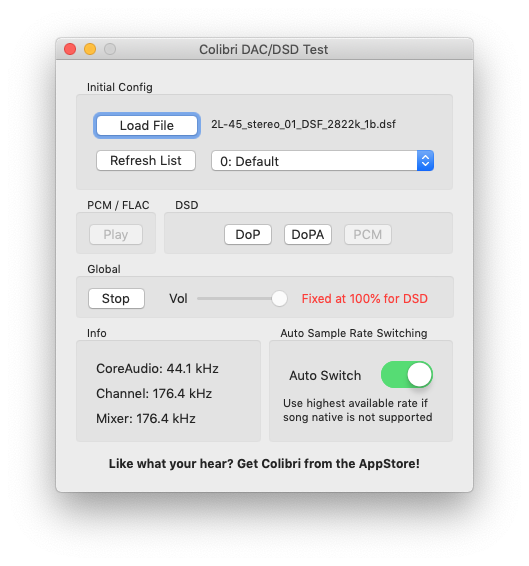 Colibri DAC DSD Test uses the same audio core as Colibri. It’s a free download from the Mac AppStore, while Colibri is a paid. Think of it as a demo version of sorts. If you are wondering how Colibri sounds with your audio device, this is for you! Yes, it is 100% free – there are no subscriptions, in-app purchases or anything of that sort. You can get it from the Mac AppStore – click here to be taken there. Simply load a DSD/FLAC/WAVE file, select your audio device and hit one of the playback options. Automatic Sample Rate Switching is also available with switchable fallback to highest supported sampling rate. A quintessential indicator whether your device properly communicates with CoreAudio. Be warned that due to the requirements of DSD playback, audio volume output is fixed at 100% during DSD playback – this is to retain the pure payback signal and is intentional. DSD signal can not me modified in any way, otherwise your DAC will fail to properly recognise the signal as DSD. When a non-DSD file is played, the volume slider can be adjusted. This app is purely for sound quality and compatibility testing – it it not a fully-fledged audio playback application intended for everyday leisurely listening. For such, please try the (paid) sibling app: Colibri.